Sloan-C, Day-2 | ed. tech. for. me. First things first–please note my badge bling in the picture to the left. 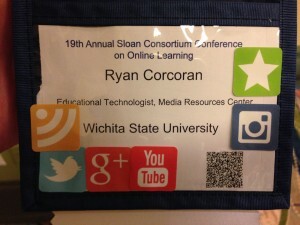 I was the first #sloancninja of the 2013 conference! Basically, that just meant that I was the first one to Tweet, Instagram, Vine, LinkedIn, and post on my blog all either about the conference, or with the hashtag #aln13. I’m a big gamification fan, so when you give me an incentive to do something that I probably would have done anyways, it’s a no-brainer! Anyways, on to more important matters. I went into day two expecting another day of the same. I was very wrong. In both good ways and bad, the second day was almost a completely different experience than the first. [pullquote align=”right” textalign=”left|center|right” width=”30%”]The Twitter chat was a very live and active community, bridging both time and space…. [/pullquote]Speaking of the backchannel, I experienced a similar situation as I did yesterday with the very active Twitter chat going on. During both last night’s keynote from Hal Plotkin, and this morning’s keynote from Coursera founder Daphne Koller, the Twitter chat was a very live and active community, bridging both time and space to break down what would have been an 80-minute lecture into smaller, digestible discussions. Presenting about the amazing wonders of MOOCs to a room full of 2500 instructional designers and online course instructors is not necessarily going to always go over well. While there were a few positive comments, most of the backchannel chat was cynical, or at least doubtful, about the MOOC’s efficacy. My own personal stance–embodied by the tweet posted below–is that MOOCs are yet another tool for the educational community to take advantage of. The question becomes: without a competency-based educational system, will MOOCs ever be able to find their solid foothold in the American academia? Finally, I do think that while these types of conventions are tremendously helpful, I can’t help but wonder if some of the confusion in our field comes from listening to how others have solved problems that we either don’t have, or have other roadblocks in our place from implementing the same solution. A small, private college in rural Pennsylvania will solve not only different problems, but also solve those problems in a very different manner than would the University of Georgia, in urban downtown Atlanta. Your own network of schools or programs with similar issues and goals may often be the best resource to draw upon for guidance and feedback.